1. I use brackets far too often. It's as if I have two writing voices running parallel to each other; the first one telling you all the facts and being sensible, and the one in brackets just throwing out some absolute wildcards and really slowing the discourse right down...kind of like when you're dragging a drunk friend home and they're saying some semi-funny stuff but they're not exactly pushing your journey in a forward motion, y'know? 2. I absolutely, more than anything ever, love puns. Like, you might think you're good at wordplay, but let me tell you, dear friends: I am better. I am super non-competitive in regards to basically everything else but pun-making? I reign supreme. I apologise in advance for messing up Natalie's carefully curated layout with all of my weird bullet points and ridiculous photos and other such annoying things. Anyway, I think the time has come for me to, y'know, properly start this whole shebang. Here is the story of Halloween 2015. Last year, as part of my degree I was living and studying in Paris. It was nice and all but the thing I looked forward to most was always having people come to visit, and at the end of October two of my friends did just that. (You may know one of them, she is called Natalie.) (...The other friend was Aimée. Just for reference.) We strolled the streets, suffered through endless flights of stairs, cried at pretty leaves, screamed far too loud watching scary YouTube videos, and one or two of us struggled to climb onto a wall at the Louvre. 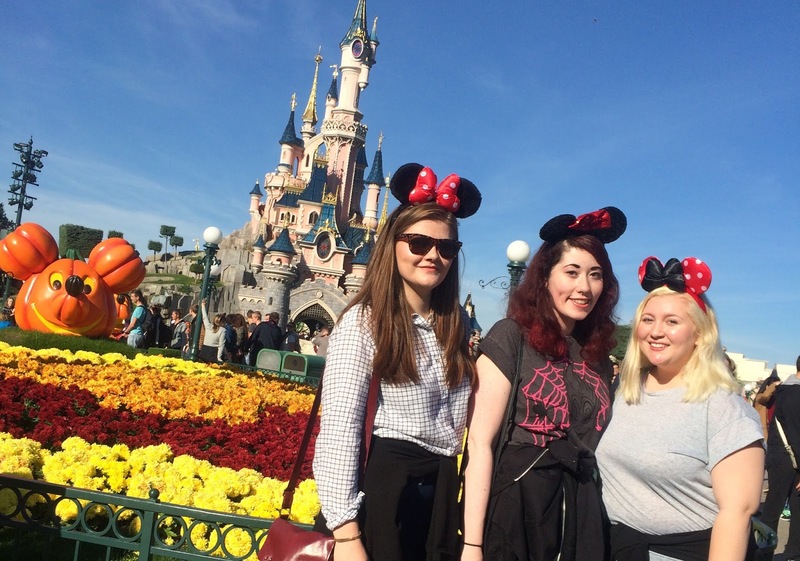 When the 31st October came around, however, we set out to experience perhaps the most defining event of our friendship: a trip to Disneyland. Yes, the three of us (The Arizona Emo Queens, The Three Emogos, Halloqueemos, Erniémom, The Three Emosketeers etc.) were going to experience the joy that is Disneyland on Halloween. We arrived at Marne-la-Vallée early-ish and made our way first to Disney Studios as we had a two-park pass and figured we'd get the smaller park finished before heading to Magic Kingdom. 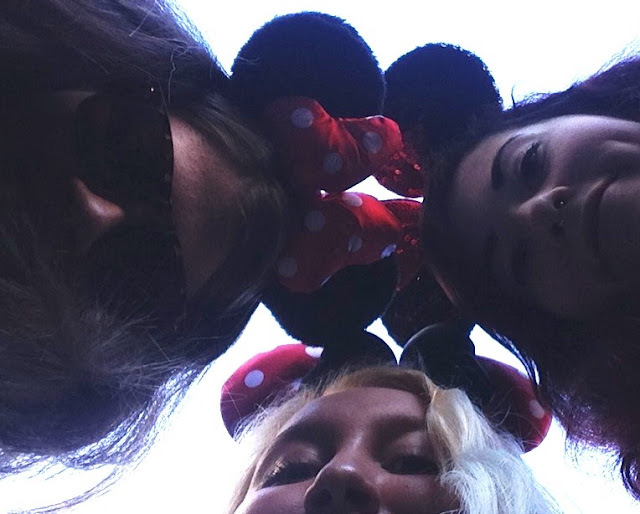 The first thing we did - and perhaps the most important thing anyone can do at Disney - was buy Minnie Mouse ears. What is a trip to Disneyland sans mouse ears? 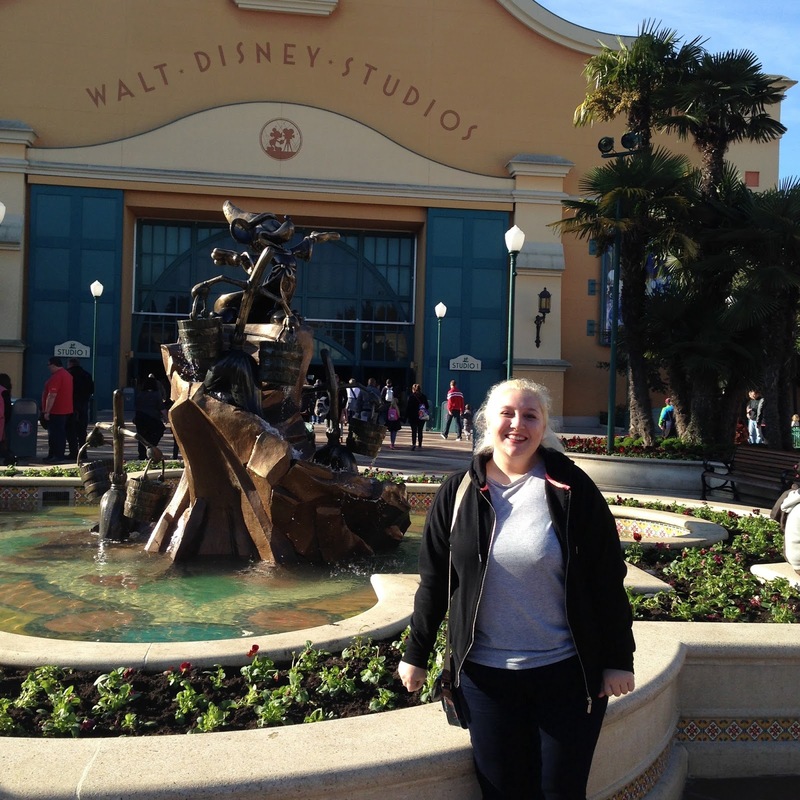 Actually, scratch that, the first thing I did was force Natalie to stand in front of a Disney fountain and allow me take a photo of her, because I am literally a mother. Look, she's even got the "ugh-Mum-I-don't-wanna-take-this" fist going on. We managed to get into the queue to meet Maleficent, who ended up being the only character we met all day. She was as magnificently evil as you would expect. We spent a ludicrous amount of time looking through all of the shops and squealing over the Disney merchandise. I would like to applaud us all, because I think between us we did quite well in restraining ourselves...though that doesn't mean we didn't all come home a few euros lighter. The simultaneously best and worst part of the day involved the Peter Pan ride. Now, I'm not sure if you know this (though it's entirely likely you do) but Natalie is obsessed with Peter Pan. Like, I wouldn't put it past her to name her firstborn Peter, even if it was a girl. Aimée too is a huge Peter Pan fan (they're in the fandom...guess you could call it the Peter Pandom), so I knew we'd definitely be going on the Return To Neverland ride. Unfortunately, we got into the queue just as there were some problems with the ride, and it also happened to coincide with lunchtime, which meant that we were queuing for what felt like hours (honestly, I've blocked it out of my memory, I have no idea how long we were actually there for), and our discomfort was exacerbated by the fact that we were pretty much starving our guts out. Is that a bit dramatic? Maybe. I was Peter Pangry. (...I did warn you.) Anyway, eventually we made it onto the ride and Natalie and Aimée were, as expected, yelping the entire time. The thing about Natalie is that when she feels any kind of intense emotion she seems to just go into a pitch that only dogs can translate, and as a result it's kind of difficult to differentiate between whether she's excited or angry or surprised. Luckily, this time it was the former, and I think the ride made the queue worth it. Finally, we made our way to get food, and I think by this point we were all genuinely quite sad. Why does hunger do this to us? We all perked up significantly when we had some pizza inside of us (...I had a lasagne actually...why was lasagne my fast food of choice? I do not know) but we were definitely beginning to tire. Disney is overwhelming, okay? After our food Aimée and I went on Space Mountain (better than the Florida one, I won't lie to you) while Nat waited for us outside. Finally, we made our way back towards the castle, where we would watch one of the parades, this one featuring - you guessed it - Peter Pan. I don't think I've ever seen someone with as much joy on their face as Natalie watching the parade and seeing Peter Pan for the first time. 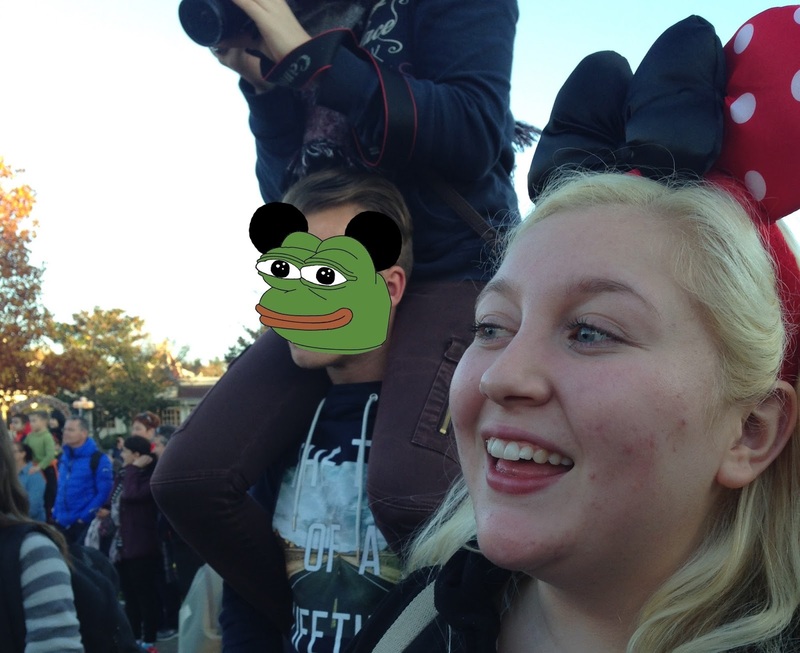 Oh by the way, if you couldn't tell, I've edited the guy in the background's face, xo. After some happy, Disney-induced tears from certain people (I'm naming no names) we took some photos of the sun setting behind the castle, got some final snacks and drinks, and then made our way out of the park, waving goodbye to the castle and our pal Peter. Hold up, I'm not finished yet. We went back into the first park to see if there was a queue for Rock 'N' Roller Coaster and luckily for us there was hardly any line at all. I love this ride, and I wish we could've gone on twelve times but alas, we were getting more and more tired with every passing minute. Apparently not tired enough to skip out on a second Tower of Terror ride, though. Personally, I find the scariest thing about Tower of Terror is the workers, rather than the ride itself. Why are they so intense? One of them said to Natalie she wasn't allowed to leave when she decided she didn't want to ride it and I think we were all about to poop ourselves. (Don't worry, he was joking...he was just scary about it.) By the time we had taken this final ride of Tower of Terror, in which I may or may not have accidentally punched Aimée in the face, the parks were soon to close, and so we said goodbye to Disney and all of the joy it holds. It was a tiring but cute-as-heck day. We made our way back to my apartment, took off our makeup, put on our PJs and then Natalie and Aimée cried yet again, this time over a livestream of a 5SOS concert. Honestly, for a happy day, they sure did cry a lot. Let's be honest though, thinking about it, how else would we have wanted to spend Halloween, if we had the choice? In retrospect, I think the only things I would've changed about the day would be to have a) made it longer and thus be able to meet more characters and spend more time enjoying the details / b) queued for less time for the Peter Pan ride. How about being Peter PUNCTUAL?! ...I should leave now. Natalie, please take the mic from me, I shouldn't be trusted. Please.